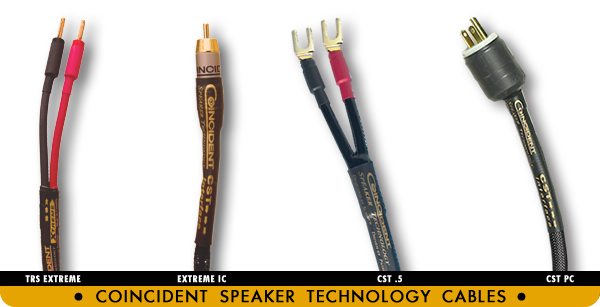 To celebrate Coincident Speaker Technology 20th Anniversary, we are thrilled to announce the Statement Series – A breakthrough in cable technology and performance. The Statement Series' superiority is not predicated on a single novel technique or approach but rather that the design for the Statement Series (and the CST Extreme) is based upon genuinely advanced technology, applied in a "total system" approach, to each specific cable application, always in accordance with CST's basic controlling philosophy that the cable should pass the signal exactly as it receives it, with no addition, subtraction, or perversion. These internally generated fields (the intensity of the electromagnetic field controlled by current flow, and that of the electrostatic field controlled by voltage) both – individually and by their interaction – affect the signal passing through the cable, and therefore profoundly impact the sound of the entire system. Cable Design and Construction – What is Important? – Everything ! Many cable manufacturers believe that there can be one "magic" solution that will always result in "perfect" cables. This simplistic approach will yield a highly compromised product. While many view cables as bits of wire and plastic, cables are extremely complex in their operation, and each of its component parts greatly affects their performance: The geometry and material used for the conductors (usually either copper or silver in most audio cables) has a clear and obvious effect on the sound of your system. Equally relevant is the thickness (the AWG gauge) of the conductors, their purity, how they were made, and whether they are solid-core or stranded. Dielectric and capacitive discharge effects mean that the choice of insulating material for the primary wires, it's dielectric constant, its "dielectric absorption" or "dissipation factor", its "dump rate", and how thickly it's applied and its air to solid ratio are all crucial in accurately passing the signal the cable is fed. Furthermore, the type and thickness of each of the overall conductor jackets, the filler materials, if any, and the final overjacket on the finished cable all combine to greatly impact on the veracity of the resultant signal. Whether or not the cable is shielded is highly significant as well, because shielding – even shielding done the way CST does it – can affect sound quality and overall system performance. And so can the spacing of the shield, if any, over the cable and the spacing of the conductors within it: The distance between them determines the capacitance and inductance of any pair of conductors, and those factors, plus the resistance of the conductors themselves, are the sole determinants of the cable's characteristic impedance. The ultimate importance of absolutely everything in cable design is perhaps best illustrated by the circularity of its center core. If it is not perfectly round it will significantly affect how closely a coaxial cable will conform to its designed impedance specifications. STATEMENT Series speaker cables are eight conductors of 16 gauge (AWG) in their normal "shotgun" configuration (2 legs per conductor) or four conductors of 12 AWG when terminated in the optional "bi-wire" mode. Protruding through these caps at either end are the actual hook-up ends of the cable. These are sheathed in multi-element air-dielectric tubes. The actual termination is, in every case, an individually billet-machined cryogenically-treated 24K direct gold-plated copper spade lug (of either 6.0 or 8.5 mm terminal size). Premium Deltron™ brand bananas are also available. looking for accurate, loss-less, high performance sound. The ST-4U is an optimized digital interface between computer hard drives and USB-input DACs. Computer-based systems are capable of smooth and detailed sound, especially with high-resolution recordings. But as with any system component quality, well-designed low-jitter USB cables are vital. The ST-4U cable is constructed from silver copper alloy conductors with ultra low-loss, high-density PE (polyethylene) dielectric insulation. It also features quad shielding and non-magnetic 24K Mil-Spec gold-plated USB 2.0 connectors with an internal EMI shield incorporated directly into the connector. Optimized for clear and open highs, elegant midrange textures, powerful, tight bass and incredible soundstage & imaging, plus improved frequency extension and tonal balance. $295 US each additional ft pr. ST-5/JS- (Jumpers) – Are an alternative to using biwire speaker cable. The jumpers are made from the same conductors and dielectric materials as the ST-5 speaker cables and exactly replicate their performance. ST-10 AC Power Cable - This is the ultimate premium version of the spectacular new power cord that's getting rave reviews from audiophiles and reviewers everywhere. Sharing an entirely new approach to power transmission technology with CST's Extreme AC cable, it's an 10+ equivalent gauge (AWG), multi-conductor, PEX dielectric masterpiece that will clearly and obviously outperform almost any other AC power cable several times its price. Amazing high frequency detail, sweetness and extension, coupled with greater image width, depth and focus, plus utterly astounding bass "weight", power and "slam" make this new power cable a required addition to any High-End system seriously intended to challenge the state of the art. Due to unique geometry and special double shielding, AC noise levels and RFI are dramatically reduced. Furthermore, the absence of any current limiting makes this cable especially excellent mated to high power amplifiers. ST-10 AC power cables are jacketed in special densely - woven braid. Each power cable is fitted with premium Hospital-Grade U.S.-style NEMA 3-prong plugs and 15A IEC connectors. European-style Schuko or 20 Amp connectors are also available at nominal additional cost. $70 US each additional ft.
Price: RCA-RCA - $695 US - 1M Pr.